Dog behavior problems can be a real challenge for pet owners. A dog with a behavior problem can disrupt the home and, ultimately, if the problem is serious enough, the owner may decide they can no longer keep the dog. If you’re faced with behavior problems what can you do? Here are some tips. In many cases, behavior problems stem from a lack of early socialization in puppies. Socialization is the process of encouraging puppies to become comfortable about other people and animals. It builds their self-confidence and helps to teach them about the world. Of course, they won’t learn about everything they may encounter in life, but they will become more prepared to deal with unexpected events. If a cat jumps out of the bushes or someone opens an umbrella, they will understand that these things aren’t going to hurt them. Socialization can help bring out the best in puppies and dogs and it’s recommended for all puppies. If you have a puppy or a young dog, by all means take them places, encourage friendly people to pet them, and let them interact with other friendly dogs while on a leash. For dog behavior problems later in life, socialization can still help overcome some problems. There are actually two forms of aggressive dog behavior. Your dog may show aggression toward other dogs or pets or toward you. If your dog is showing aggression toward other dogs or pets, the problem is often jealousy or rivalry. You may be the unwitting cause of the jealousy in the home. Your dog may be jealous of any attention you show toward the other pet. It can be difficult to resolve these conflicts, especially if there is an age difference between the two dogs (puppy/adult or adult/senior dog). Experts say that once one of the dogs has established his position as the dominant dog you should not undermine him by showing preference for the other dog. For instance, if a young adult dog has become the new leader in the home, experts would advise you not to show preferential treatment for a senior dog who has been displaced as the leader. However, it can be very hard to follow this advice in practice. You will have peace in your home if you show that you accept the young adult dog as the new boss dog, however, and feed him first, pet him first, and so on. He will stop trying to demonstrate that he’s the boss by being aggressive toward the older dog. If you have a situation where a dog in your home is being aggressive toward you it’s best to call a canine behavior consultant. This can be a dangerous situation and you probably need expert guidance so you aren’t injured. 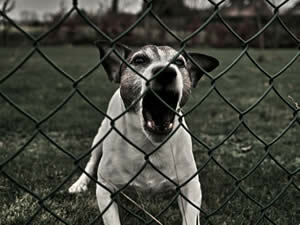 Learn more about aggressive dog behavior. There is usually a clear link between separation anxiety in dogs and a lack of socialization in dogs when they were puppies. The more you socialize your puppy when he’s young, the less likely he will have problems with separation anxiety as an adult dog. If your dog comes from an animal shelter or had problems with abuse when he was young, then he could have problems with separation anxiety. If your dog does have problems with separation anxiety, the usual treatment is behavior modification along with medication to calm your dog enough to learn new, positive behaviors. You will probably need to work with a canine behavior consultant in many cases. Learn more about separation anxiety in dogs. Dogs eating poop is one of the less desirable things that dogs do. Coprophagia can be caused by a number of things, including health problems. It can indicate that your dog has a deficiency in his diet. If your dog is eating poop you should talk to your vet to see if any tests are needed or if you need to change your dog’s food. However, dogs eating poop often occurs for behavioral reasons. It’s theorized that mother dogs clean up after puppies and they may simply become a little overly diligent about eating poop. It can become a bad habit. You may have to try different substances before you find something that works for your dog. It also helps to scoop as soon as your dog potties so he won’t have anything to eat from the yard. Some people resort to making their dog wear a muzzle when the dog is in the yard. Learn more about Dogs Eating Poop. Many dogs are prone to dog chewing at some time during their lives. Both puppies and adult dogs like to chew. They may chew on woodwork, furniture, plastic, soft things, hard things — you name it. Virtually anything in the home can become a chew toy for your dog. Most people try to discourage their dog from chewing by using different kinds of bitter agents. There are many different versions of these products sold in pet stores and online. They come in different bad-tasting flavors so you can try them until you find one that works with your dog. They come in cremes, liquids and sprays so you can use them on most materials. They are safe to use and won’t harm your dog if he does lick them off an object. Of course, you may also scold your dog or chase him away if you find him chewing a valuable object. In some cases dogs will outgrow the desire to chew. This usually happens with puppies after they are through teething and tasting everything; sometime after they’re a year old. Learn more about how to stop dog chewing. Some puppies and young dogs may submissively urinate to show respect for another dog or person in a position of authority. These puppies or dogs may be very sensitive or they may not have learned other, better ways of showing respect. In some cases they may have been abused or treated harshly, or over-corrected or punished. You can deal with submissive urination by ignoring it. If you scold your puppy you will just make him more fearful and he will likely urinate more. If you offer him comfort or pet him he may think you are praising him for urinating. So, ignore the submissive urination. The best thing you can do is work on improving your puppy’s self-esteem and confidence. Try teaching him some basic obedience. This is one of the best possible ways to build up a puppy’s confidence and make him feel good about himself. He will earn lots of praise and you will have good positive interaction. If you work on his obedience skills the submissive urination should stop since he will find better ways to communicate with you. Learn more about submissive urination. Dog behavior problems can be quite complex. There usually aren’t any easy fixes. But if you take each problem and work with your dog to find a solution, you can find the answers you need.